Silver prices got a slight bump this week, as traders continue to feed into the momentum of precious metal investments generated by fear of earlier-than-expected interest rate hikes. Silver prices are up about 1.3% on the week to $21.13 as of 12:17 p.m. today (Friday). This week's climb is not as dramatic an increase as last week when the specter of rising interest rates hung above investors following the U.S. Federal Reserve's FOMC meeting. Silver was up 6.1% last week and volume picked up as well because of the Fed. A lot of the trading this week is investors looking to pile up on last week's surge, Richard Checkan, president and chief operating officer of Asset Strategies International in Rockville, Md., told Money Morning. This month silver has performed well, bringing in 12.3% returns since it bottomed out at the end of May. 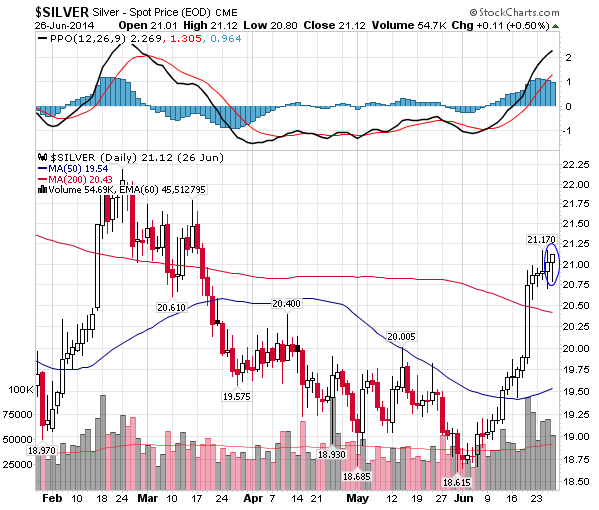 Silver is trading above both its 50-day moving average of $19.54, and its 200-day moving average of $20.43. "I think silver prices have been strong because they've simply lagged for a long time, and because gold has also recently reversed and headed strongly higher," Money Morning's Resource Specialist Peter Krauth said. Silver will often move with gold prices, Checkan said, because as investors move into gold for one reason or another, they will look to diversify within precious metals and silver is an obvious second choice. Because the silver market is very small compared to the gold market by volume, when investors do pour into silver, it will not only increase with gold, but outperform it. "Once the trend is established, silver starts getting buyers, it starts to outpace gold because it's a smaller capitalized market," Checkan said. "It's like throwing a rock into a lake versus a puddle, the relative splash is much bigger in the puddle." " generated by fear of earlier-than-expected interest rate hikes". Higher interest rates compete with precious metals, which offer no yield and are taxed at a flat 27%. Higher interest rates also strengthen the dollar which also competes with precious metals. So, the convenient explanation(s) fail the test again. Volatility may be low but uncertainty is very high and confidence fast eroding. That is bad for all investments. Commodities respond to sentiment yes, in this instance fear. Speculators are afraid of the unknown consequences of an obvious incompetent Janet Yellen and don't really know what she will do or when. Interest rates may or may not be raised by the FED. The markets have the final say on the matter.